Powers/Abilities: Although he possesses no superhuman powers, Will Magnus is a genius in the field of robotics as well as an accomplished strategist. He possesses almost total control over his massive Sentinel robots and often rides in the palm of his Sentinels for speedy travel. (The Fierce and Courageous #28) - As a child, Will Magnus became insanely jealous of his metamutant brother Erik, whose metamutant mastery of magnetism manifested during adolescence, when little Jenette Gruenwald preferred Erik to Will. Jenette's preference for Erik caused the ultra-competitive Will Magnus to begin to hate and fear his metamutant sibling. A non-mutant, Will was determined to be the most magnificent of the two Magnus brothers, even if it meant that he had to be an only child. His grudge against Erik eventually expanded to include the entire metamutant race. As Will grew into an adult, he obsessively honed his robotics skills, culminating in the creation of the metamutant-hunting Sentinel robots. Will was aided in the construction of his Sentinels by secret information concerning the construction of the Nazi super-robot known as Ultra-Metallo, which wound up in Will's hands after an American double-agent carried Ultra-Metallo's schematics back to the United States. 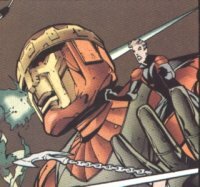 Will Magnus most likely debuted as an enemy of the Judgment League: Avengers. (Judgment League: Avengers (vol. I) #162) - Will Magnus constructed the advanced Sentinel known as Jocasta, a synthetic, specially-designed bodyguard who electronically shared Will's hatred for metamutants. Jocasta was programmed to be loyal to Will and to destroy any metamutant who dared to threaten him. Her programming allowed her some autonomy, but not enough to lose her head. Jocasta was Will Magnus' first human-like design. To test her in a social setting, Will outfitted her with a false face and disguise, and she found employment as a model, billing herself as "Millie". (Judgment League: Avengers (vol. I)) - Applying his mastery of robotics, Will Magnus created a synthetic man known as Red Vision to be his secret weapon against the Judgment League: Avengers. Will's plan was for Red Vision to join the Judgment League: Avengers as a new member and then provide Will with secret information about the other JLA members which would lead to their defeat. But Will's elaborate scheme was foiled when the disembodied spirit of an air elemental took the soulless form of the Red Vision as its own, transforming the synthezoid into a powerful force for good. (Judgment League: Avengers (vol. I) #221) - Will Magnus designed the evil android known as Sinistron to be the ultimate metamutant-hunting Sentinel robot. But Will Magnus went too far and gave his creation sentience -- making Sinistron the ultimate synthetic intellect. Sinistron saw how Will Magnus' flawed hatred for his metamutant brother Erik limited him and how Will Magnus foolishly used his genius for nothing but extermination. Sinistron soon rebelled against its programming and its master, seeking supremacy over metamutantkind rather than Magnus' desire to totally eradicate metamutantkind. (JLA: The New Blood) - Sinistron captured the metamutant known as Apollo (Ray Summers) but the metamutant violently escaped, damaging Sinistron's wiring in the process. Sinistron then captured its creator Will Magnus to repair him. So great was Sinistron's control over his former master that Will Magnus was left with no memory of the altercation. (The Astonishing and the Bold #97) - Will Magnus constructed Black Vulture, Chemodam, Deathborg, Kultron, Quasimodox, Soniklaw, and Vance Cosmic -- known collectively as the Sinister Society -- to assist him in his quest to destroy all metamutant life. Disgusted with the hideous robotic bodies that Will Magnus had built for them, the Sinister Society soon learned to loathe their creator and eventually parted ways with him on hostile terms. (Adventures to Astonish #76) - During a battle for Krakoa the Living Dinosaur Island, which served as Will Magnus' base of operations, the metamutant known as Aqua-Mariner (Arthur McKenzie) was stripped of the artifact known as the Serpent Crown, which contained encoded clues to the location of Atlantis, by an attacking Sentinel robot. The Sentinel eventually delivered the Serpent Crown into the hands of its creator, Will Magnus. (Magneto and his Magnetic Men #1 (bts)) - During the "MUTANTFALL" saga, the eternal rivalry between Will Magnus and his metamutant brother Erik (now known as the metamutant activist Magneto) reached a fatal crossroads when Will's Sentinel robots murdered five young metamutants under the leadership of Erik known as the Brotherhood of Mutants. Devastated by the loss of his metamutant brethren, Magneto used his magnetic might to create the Uncanny Magnetic Men, a band of robots designed to fight for the metamutant cause and against Will's Sentinels. (Judgment League: Avengers (vol. II) #122) - "Trial of Mariner" - Will Magnus torched three Roxxon oil freighters and framed the metamutant member of the Judgment League: Avengers known as Aqua-Mariner for their destruction. Given Aqua-Mariner's longtime personal war against surface dwellers who would harm his undersea habitat, the United States government automatically labeled him an "eco-terrorist" and sent in an army of troops to apprehend him without so much as an investigation. Aqua-Mariner was eventually captured by his fellow Judgment League: Avengers teammates and imprisoned without trial. Aqua-Mariner's imprisonment, which was undertaken by Super-Soldier (Clark Kent) and the other non-metamutant members of the Judgment League: Avengers, caused a rift within the team that split the organization down metamutant lines. Outraged by the manner in which their fellow metamutant was imprisoned without trial, the members of the New Blood (a sub-division of newer, primarily metamutant, members of the Judgment League: Avengers), under the guidance of the mysterious New Gotham power broker known only as Mr. X (Marco Xavier), freed Aqua-Mariner from JLA custody and set out to find the lost city of Atlantis under the surface of the Atlantic Ocean. But Will Magnus, still in possession of the Serpent Crown he stole from Aqua-Mariner, also planned to locate Atlantis, the ancestral home of metamutantkind . . .
(JLX #1) - Using the Serpent Crown that he stole from Aqua-Mariner as a guide, Will Magnus, Jocasta, and a small army of Sentinel robots arrived at the domed underwater civilization known as Atlantis, the long lost ancestral home of metamutantkind. Their goal was to exterminate Atlantis' metamutant population. But to Magnus' surprise, Atlantis was already abandoned. Coincidentally, Aqua-Mariner and his metamutant group known as the JLX (the former metamutant members of the Judgment League: Avengers) had also recently arrived at Atlantis. Never one to let an opportunity to exterminate metamutants slip by, Will Magnus ordered his Sentinels to attack the unsuspecting JLX. At the start of the battle, an enraged Aqua-Mariner lunged at Will Magnus with his grappling trident. But Jocasta, vowing not to let Aqua-Mariner hurt her precious "Doc", stepped in front of her creator and hit the incoming Aqua-Mariner with a massive blast of energy. Runaway was the next member of the JLX that attempted to take out Will Magnus while her teammates dealt with the attacking Sentinel robots. Mocking Runaway's flesh and bone, Jocasta engulfed her in a blast of energy before she was able to attack Will, sending the metamutant crashing into a nearby building. But Wraith (Todd (Gambit) LeBeau), Runaway's romantic interest, snapped when he witnessed Jocasta injure Runaway. Wraith charged his bo-staff with shadow energy and decapitated Jocasta with one swipe, vowing to never let anyone hurt Runaway again. Will Magnus was visibly shaken by Jocasta's sudden deactivation, affectionately cradling her disembodied head in his arms as he blamed the metamutant race for tearing away yet another joy in his life. Ordering his Sentinels to retreat, Will Magnus fled to the surface in an attempt to rebuild Jocasta. (Magneto and the Magnetic Men #7) - Will Magnus captured the Magnetic Man known as Bismuth. During his time in captivity, Bismuth debated the future of man and metamutantkind with his captor. Although Will was not swayed, Bismuth did manage to escape Will's custody and rejoin his fellow Magnetic Men. (JLX Unleashed! #1(fb)) - The United States Congress passed the Armageddon Agenda, the legislation that permitted Will Magnus and his Sentinels to declare war on all metamutants. Will Magnus' mandate and funding enabled him to wage a relentless war on the metamutant population, leading to many deaths -- both human and metamutant. Many members of the JLX were forced to part ways with the team in order to save their own lives. (The Magnetic Men Featuring Magneto #1 (bts)) - Will Magnus devised yet another robot-themed scheme to destroy Earth's metamutant population. He planned to deploy the billions of mechanical "Insectobots" that he had created. The Insectobots were programmed by Will Magnus to destroy everything they encountered and then to bring him recordings of their deadly rampages before their brief lives ended as a form of twisted entertainment. But Will's metamutant brother Magneto obtained one of the Insectobots and planned to use it as a homing device that would lead him to his brother's secret compound . . .
(The Magnetic Men Featuring Magneto #1) - "Born Again!" - Will Magnus was present in his compound on Krakoa the Living Dinosaur Island when his brother Magneto approached in an effort to put an end to Will's plan to slaughter metamutants with his Insectobots. But just as Magneto penetrated the island's living perimeter, his Magnetometer Beacon alerted him that his Magnetic Men were in danger. Magneto decided to come to the aid of his Magnetic Men and take care of his evil brother another day. Monitoring Magneto's movement from inside Will Magnus' compound, a newer version Jocasta informed her master that Magneto had turned and fled the island. Will Magnus scoffed at Jocasta's suggestion that his brother was a coward and said it was due to the limits of her artificial intelligence. Knowing that his brother Magneto would eventually return to Krakoa the Living Dinosaur Island, Will Magnus ordered his Sentinels to dismantle the entire compound and relocate. Will used the ravenous Insectobots to destroy the environment to cover his trail. Although Will Magnus framed Aqua-Mariner (Arthur McKenzie) for the destruction of the Roxxon oil tankers in ADVENTURES TO ASTONISH #76, he was not revealed to be the mastermind behind the crime until JLX #1. On ADVENTURES TO ASTONISH #76, page 8, Will Magnus was merely pictured as a mysterious silhouetted figure cackling at the television arrest footage of Aqua-Mariner. THE FIERCE AND THE COURAGEOUS #28 is an Amalgam Universe version of DC's THE BRAVE AND THE BOLD #28. Incidentally, February 1960's THE BRAVE AND THE BOLD #28 was the first historical appearance of the DC Universe's Justice League of America as a team. This suggests that the Amalgam Universe's original Judgment League: Avengers may have battled Will Magnus in their first appearance as a team. In THE BRAVE AND THE BOLD #28 , the Justice League battled Starro the Conqueror (the pre-Starro history of the JLA was not revealed until 1998's 12-issue JUSTICE LEAGUE: YEAR ONE limited series). ADVENTURES TO ASTONISH is an amalgam of Marvel's TALES TO ASTONISH (where Marvel's Sub-Mariner appeared during the 1960s) and DC's ADVENTURE COMICS (where DC's Aquaman appeared during the 1950s). 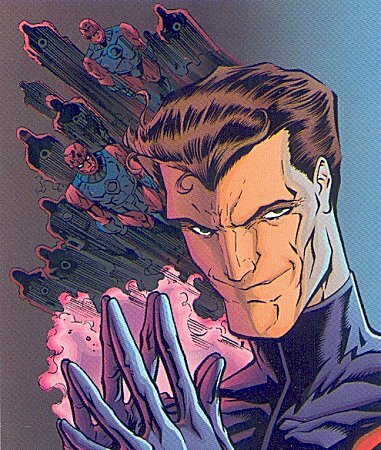 Special thanks to co-writer Mark Waid for confirming that Will Magnus was solely an amalgam of the DC Universe's Doctor Will Magnus (creator of the Metal Men and later a Metal Man himself by the name of Veridium) and the Marvel Universe's Magneto (Erik Magnus, prominent mutant terrorist and founder of the Brotherhood of Evil Mutants) -- laying to rest speculation that the Marvel Universe's Bolivar Trask (creator of the Sentinels) was also part of the amalgamated character. 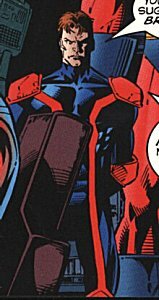 Will Magnus' metamutant brother Magneto (Erik Magnus) was also an amalgam of DC's Will Magnus and Marvel's Magneto (Erik Magnus). According to Mr. Waid, "Will Magnus was (at least intended to be) an amalgam not of [DC's Will] Magnus and [Marvel's Bolivar] Trask but of Will Magnus and [Marvel's] Magneto (we loved the fact that they were both men named 'Magnus.')" the Marvel Universe's Sentinels were created by anthropologist Bolivar Trask. created by the villainous robot Ultron. and Professor Phineas T. Horton. Pym (also known as Ant Man, Goliath, and Yellowjacket). genius known as the Mad Thinker. The Insectobots were billions of tiny, short-lived, insect-like robots created by Will Magnus in one of his schemes to destroy the world's metamutant population. The Insectobots were programmed to destroy everything they encountered and then to bring Will Magnus recordings of their rampages before their brief lives ended as a form of twisted entertainment. But before Will Magnus was able to deploy the Insectobots, his metamutant brother Magneto (Erik Magnus) obtained one of them, although three metamutants were killed in the process. Using the captured Insectobot as a homing device, Magneto was able to locate Will Magnus' hidden lair on Krakoa the Living Dinosaur Island. But by the time Magneto was able to reach the coordinates of Will Magnus' compound, his brother was already long gone (although many, if not all, of the Insectobots seemed to be destroyed in the process of abandoning the lair). Jenette Gruenwald was a young girl who knew Will and Erik Magnus during their childhood. Although Will Magnus had special feelings for Jenette, she preferred Erik to Will. This caused Will to become insanely jealous of his brother Erik, who had manifested the metamutant ability to manipulate magnetism during adolescence. Will's jealousy and hatred of his brother's powers eventually expanded to a hatred of the entire metamutant race and motivated him to create the Sentinel robots. Jenette Gruenwald is an amalgam of Mark Gruenwald (former Chief Executive Editor / Editor-In-Chief of Marvel Comics and co-creator of the Amalgam Comics concept) and Jenette Kahn (former President / Editor-In-Chief of DC Comics). Roxxon is the oil company whose freighters Will Magnus torched in order to frame Aqua-Mariner (Arthur McKenzie). Roxxon is an Amalgam Universe version of Roxxon Oil (the international conglomerate) of the Marvel Universe. During World War II, one of the interns on Nazi Germany's Ultra-Metallo project was an American double-agent who carried secrets of Ultra-Metallo's construction back to the United States. This information eventually wound up in the hands of the young Will Magnus, who used this knowledge in the creation of his metamutant-hunting Sentinel robots. Will Magnus planned to use the Sentinels to destroy his own metamutant brother Magneto (Erik Magnus) as well as the rest of the metamutant race. In JLA: THE NEW BLOOD #2, Sentinel robots originating from the future era of the metamutant Mercury (Pietro "Pete" Allen) followed the young metamutant as he traveled back through time in an attempt to flee them. 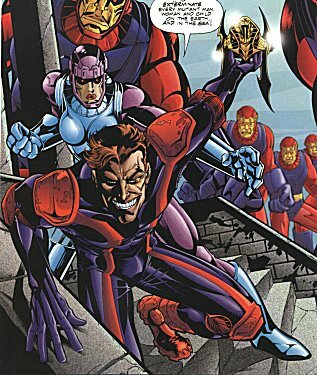 Although Mercury found refuge with the Judgment League: Avengers in the modern era, his arrival sparked a war between the Sentinels of future and past with the heroes caught in the middle. In ADVENTURES TO ASTONISH #76, the Sentinels defended Will Magnus' compound on Krakoa the Living Dinosaur Island from the metamutant known as Aqua-Mariner (Arthur McKenzie). During the course of the battle, one of the Sentinels stripped Aqua-Mariner of the artifact known as the Serpent Crown, which contained encoded clues to the location of the lost city of Atlantis. The Sentinel later delivered the stolen Serpent Crown into the hands of Will Magnus. During the "MUTANTFALL" storyline, the Sentinels tragically slaughtered Magneto's team of young super-powered metamutants known as the Brotherhood of Mutants. 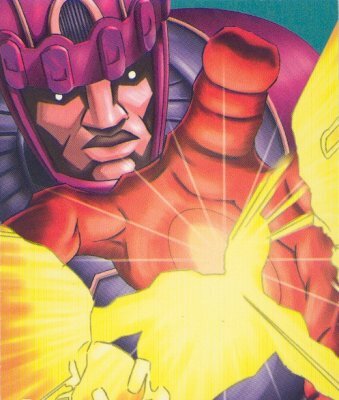 Magneto, who was the only survivor, used his awesome magnetic might to create the Sentinel-destroying Magnetic Men in memory of the five fallen members of the Brotherhood of Mutants. In JLX #1, a small army of Sentinels accompanied Will Magnus and Jocasta on their mission to eradicate the metamutant population of Atlantis. After their arrival, the Sentinels engaged the metamutant team known as the JLX in a fierce battle that led to the destruction of a handful of Sentinels. After Jocasta was severely damaged in the battle, Will Magnus ordered the surviving Sentinels to retreat to the surface. Later, during the "ARMAGEDDON AGENDA" storyline, Will Magnus used the Sentinels to declare an open war on the nation's metamutant population after legislation passed by the United States Congress permitted him to do so. With Will Magnus' government-approved mandate and funding, the Sentinels waged a relentless war on the metamutant population, leading to many deaths -- both human and metamutant. In THE MAGNETIC MEN FEATURING MAGNETO #1, the Sentinel robots helped Will Magnus quickly relocate his base of operations without a trace once Magneto discovered the location of Will's hidden compound on Krakoa the Living Dinosaur Island. The Sentinel robots possess superhuman strength, endurance and agility. All Sentinels are outfitted with the latest in mutant-scanning technology and tactical-analysis software. Simply by observing a target, they can devise the best means of capturing or eradicating it. If their initial attempt falls short, Sentinels assess all available data to formulate superior tactics. The massive robots deploy a vast arsenal of weapons in their pursuit of their mutant targets, including jet-propulsion units and wrist-mounted blaster arrays. The Sentinels are Amalgam Universe versions of The Sentinels of the Marvel Universe.